A client told me last week that he hired us to “do” social media so that he would not have to be involved. What!? Really? Would he ever consider having a storefront without a sales staff? This is the essential conundrum we have been wrestling with in recent weeks. Businesses, particularly small businesses and nonprofits, are running lean and over-tasked—especially in this rocky economy. Therefore, it’s difficult for many of them to even conceive of adding a litany of new online tasks to their already maxed-out agendas. And yet, a thriving, organic social media presence is critical to practically every business’ success in our new-media marketing universe. From texting to tweeting, we recognize the value of involving customers and empowering word of mouth online, but the question is — What is the best way to get it done? How do we manage it all? It seems to me it comes down to two options — coaching or doing. Should you hire a coach or consultant to train you and/or your employee(s) to blog and work the key social media platforms? Ideally, strategy and daily activity must work in concert to achieve best results. A post here and there does not a social media campaign make. The other option is t0 hire someone outside of your organization to “handle it” –posting, responding, blogging, monitoring, driving, and analyzing. What is most productive? How will you optimize ROI? How will this outside person or team integrate with yours and the unique needs of your operation? 13. Promoting social media connection in your store. Of course, the program will vary in size and scope –whether you are Best Buy or Frank’s Nail Salon, but the realities of execution may not be that different. For many retailers, it’s all about customer service – an inside team that monitors and responds to customer comments and complaints. For others, it’s about launching new products via Facebook, for example, or running limited-time discounts and deals. Regardless of the content or appeal, the relationship-building objective probably surpasses the importance of the final tallies of coupons redeemed or contests entered. It’s not realistic to think you can have a “social media department.” It should be woven in to the fabric of your operations. So, maybe we need to think of “doing” social media more like conducting an orchestra in real time, as opposed to, say, downloading a series of iTunes. 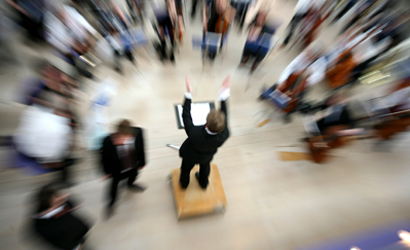 An orchestra needs a conductor to keep time in real time, indicate when to come in and when to stop – or know when to staccato or to legato. Like an orchestra performance, a social media campaign can be led by a “conductor.” But for maximum effectiveness, the organization’s actual players (the musicians) should be directly involved in making the music. They listen to each other, sense the audience’s reaction, drive the melody, layer the harmonies–and know the score. What do you think? How are you managing you social media efforts? What has worked and what has not? What are your biggest challenges? Share your stories. Sally, thanks so much for your response. I have an arts background, as well — so I see many correlations with social media. Would love to hear some examples of what you are doing in the music industry.Glad you found the post helpful. I am currently in the middle of a blogging challenge called Music Success in 9 Weeks – devised by Ariel Hyatt – creator of Cyber PR in NYC. Ariel’s book and business process really helps musicians develop an effective social media strategy and monetise their work. I am using all these principles with my clients – who are mainly musicians and help get them up and running with social media, help them set up the most appropriate channels for them e.g. Facebook/Facebook Like campaigns, Twitter, Myspace, Youtube, get them going on a blog, Flickr, and helping them to optimise their websites. For many musicians this is helping them to make a true living out of their artistic output and creating fans all round the world. However I am seeing these principles are very effective for any business and so it feels a very exciting time to be involved in social media. Sally — Thanks for sharing this! What a brilliant idea and great catalyst to actually get people started. Please keep me posted on your results. How cool. What advice do you have for those of us who not only conduct but play all the instruments as well? Sigh.